The psalmist turns here from the image of the Lord as Shepherd to the Lord as Host. One of the biblical margin notes refers to the story in Luke 7:36-50. Jesus is invited to dinner by a Pharisee named Simon. As they were reclining at the table, a woman arrives, unnamed but labeled a sinner, and breaks all protocol by entering the home uninvited. She is moved to boldness by the Lord’s presence. She lets down her hair, opens an expensive, alabaster flask of scented oil, and washes the feet of Jesus with her tears, anointing him with the perfumed oil. The Pharisee, of course, was affronted by such uncustomary behavior from a woman. Jesus took him to task, reminding Simon that his behavior also had broken rules of proper custom for a host. Jesus forgave the woman’s sins, gave her the gift of grace and love, and sent her on her way with his peace in her heart. Isn’t this exactly what he’s done for us? A few nights later, at the Passover table the night before his death he was in the presence of the enemy who controlled his friend Judas. 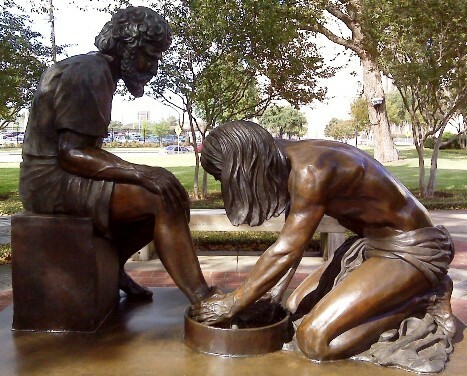 He performed the rites of host by washing the feet of his disciples. Indeed, he became the Ultimate Host. He took bread, and when he had given thanks, he broke it and gave it to them, saying, “This is my body, which is given for you. Do this in remembrance of me.” And likewise the cup after they had eaten, saying, “This cup that is poured out for you is the new covenant in my blood. Jesus’ cup overflowed that night with the love of communion, with the love of his friends, with the love of his Father. It ran over with the love he had for all of mankind and the gift of sacrifice and grace he was about to give. As recipients, we each are anointed with gifts, with grace, with mercy, and with His everlasting love. While we benefit from this anointing, it is for His glory this anointing occurs. We love because He first loved us. We are now hosts because He first was Host. Romans 12:13 When God’s people are in need, be ready to help them. Always be eager to practice hospitality. Hebrews 13:2 Do not neglect to show hospitality to strangers, for by doing that some have entertained angels without knowing. 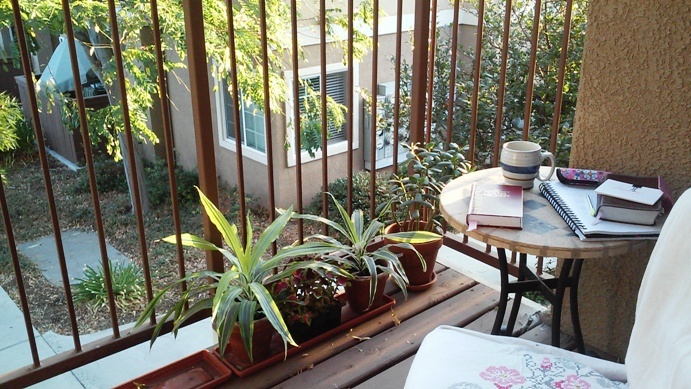 Sitting outside this morning at sunrise, I meditated on my own overflowing cup. After five, long years, I finally have an apartment of my own again. The men’s group at my church came together and in one-and-a-half hours moved my boxes and furniture from my upstairs room at one end of town to my upstairs apartment at the other end of town. Neighbors have already introduced themselves, rooms are coming together, and I am exhausted but content in my own space. The Lord promised me a “desired haven,” and He fulfilled His promise. I am grateful beyond measure. As host, I now seek ways to extend His love and show hospitality to my new neighbors. Thank you, Skye. Missed you around here! What a lovely balcony. So peaceful. I am happy for you that you have settled into your new home. Thank you so much, Mel. I was sitting outside this morning, wondering when my feathered friends would come along and at that moment, a hummingbird fluttered over to taste a sample of my hanging flowers. It was a glorious reminder of time well spent in the presence of the Lord. Jesus was so gracious as he pointed out the gifts of his followers. We must remember to use them for His kingdom. Your gift of photography, devotion and Scripture lift others in love and encouragement. Beautiful post. Thank you for coming by my blog I can’t wait to read more of yours. I feel like I am watching a loving home in the making – beautiful. Thanks Paul. One room at a time, with His abundant grace. I’m so happy for you Susan. It looks very nice. Now you have a new environment to be a shining light, which you are. Blessings my friend!!! Lol. You’re right. We just need to shine in the darkness so we must go out or have them come in to see it. Have a great weekend!!! I sure know how that feels, to be so full and blessed. Congratulations on your new home. I’m sure you will enjoy it. Thanks, Deborah Ann. You, too, have a gift and your sharing brings His love light to the world. Congratulations Susan – what a blessing! Indeed, Diana. And your anointing is quite a blessing, too!